Have you ever wanted to become a Shenkuu Palace Guard? Katsuo the Kougra does! 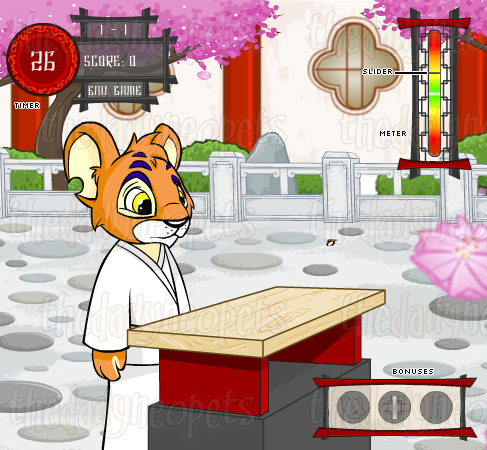 Help him practice his strength, fighting skills and concentration in Top Chop! It sounds like the simplest game in Neopia; hit your spacebar when the slider is in the green zone before 30 seconds are up. Sounds easy enough! And really, it is. Although you don't need strength and fighting skills like Katsuo, you do need concentration, and of course, practice! There are three levels you can complete. All three are basically the same with slight differences. (You can read more about these below). Here is a screen shot of the first level to help get you familiar with the layout of the game. The Courtyard is where you start, and has three blocks to break. The slider moves nice and slow for the first two blocks, and often speeds up a little on the third; not much faster though. This level is, of course, the easiest, however there are pink flowers that float down the screen from top to bottom which are irritating, because they cover up the meter. They don't cover it for long, but it's frustrating. Although once you're familiar with the game, this shouldn't bother you too much. They also slow down the game if you're using an older computer, in which case you may want to play the game on a lower quality. Imperial Guard Dojo is the second level, with four blocks to break. I find this is the easiest level because it has no annoying flowers or other items covering the meter. The green area is a little bit smaller here, and the bar will move faster. The only other difference from level one is, after a few seconds, if you haven't hit the spacebar, a Moffit will jump across the block. It hops over the block for four seconds and you aren't allowed to attempt to break the block while the Moffit is on it. Emperor's Grand Hall is the final level! You have five blocks to break. Although the same principle applies; hit the spacebar when the slider is in the green zone; it's quite different from the previous two levels. The green zone is smaller still, and if that's not enough, it MOVES! Up and down from top to bottom like the slider does. So not only are you having to keep track of the slider, but where the green zone is too. And of course, the slider moves faster as you progress. 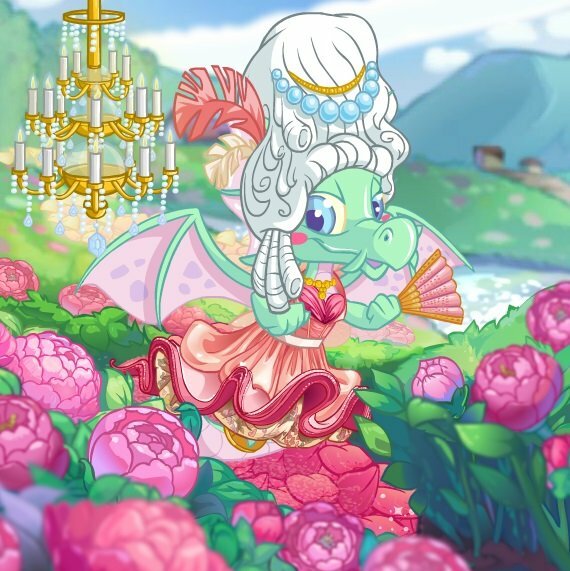 No flowers here, but there's an annoying Acara who enjoys waving a red flag over the meter. He leaves it there for about two seconds, and it happens three times before the timer reaches zero. I recommend waiting until you can see the entire meter before hitting the spacebar. Here are examples of what the meters look like in each level. The closer to the middle of the green zone you get, the more points you're awarded. If you do happen to miss and get game over, you still get some points depending on how close to the green you were. The least you can score is around 88 (very far away from the target, and game over) and the most is around 165 (perfect hit). If you have 22 seconds left on the timer, you will be given 22 points as well as the meter score. So including you meter score, time score and if applicable, bonus score for a perfect hit (20 points), you could get around 214 points per round. You can collect Bonuses throughout the game. Take a look at the thin white line in the middle of the green zone. If you're able to hit it, you'll be awarded 20 extra points for a perfect hit. If you manage three perfect hits (they do NOT need to be three in a row though) you will be given a bonus. To activate it, click on it when it's in the bottom right corner after you have been awarded it on the 'Continue' screen. There are three possibilities and what you get is random, but they are all useful. Also, you can only store one bonus at a time. Use it while you can! Otherwise you'll have to get rid of one if you collect two. As I said earlier, you may find it easier if you are using an older or slow computer to play on a lower quality. 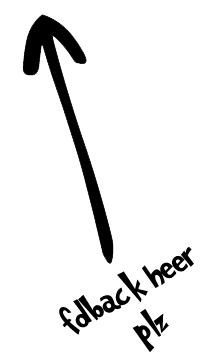 Often, the slider will be moving at a nice slow pace, then after a second or two will suddenly move up and down at a much faster speed! It's not a glitch or your computer, it's simply part of the challenge and something you need to be aware of. 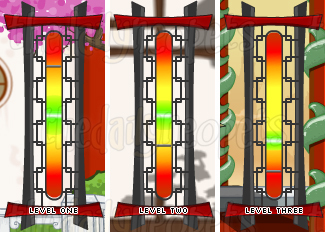 On the third level, it's easier to hit the green zone when it's at the top or bottom of the meter. It isn't moving as fast, as it's changing direction! You can practice on or begin playing at any section of any level (as long as you have unlocked it). The final three of the third level however remain permanently locked even if you pass them. Note: The game does not seem to award clothing items anymore. Information that is provided below is only displayed for its historical purpose. You may or may not know that this game gives out wearables! Here is what you can win, and how to go about it. White Top Chop Trousers You will get both of these for submitting your first score! White Belt You will get this by submitting a score after completing 2:1. (The first section of the second level). Green Belt You will get a this by submitting a score after completing 3:1. (The first section of the third level). Red Belt Three perfect hits on 3:3, 3:4 and 3:5 (the third, fourth and fifth sections of the third level) will get you a Red Belt. Black Top Chop Trousers Such a mystery! Solutions for these three items are currently unknown. Top Chop is an addicting game which is easy to understand and play. Plus it gives out free clothes for your Neopet! If you can master it, perhaps you'll be unlocking the secret to the Black ones!